As many now know, the current trend of the major Hollywood studios is to looking towards the past for film ideas rather than striving forward. Yes, I’m talking about the somewhat direction that Hollywood is going through in its plethora of remakes and reboots. Ranging from big to small named ones and pulling from both movies and TV show, the whole current motion of these remakes (according to Hollywood) is to “revamp” old features and present them to a new audience. Some have been hits (i.e. 2001’s Ocean’s Eleven, 1983’s Scarface) or even in its reboots of mainstream films (i.e. 2005-2012’s The Dark Knight trilogy to 2011-2017’s Planet of the Apes trilogy), while others have flopped, with 2017’s CHiPs being the most recent addition to being a bad movie. Now, continuing the recent trend of Hollywood remakes, Warner Bros. Pictures and director Zach Braff present the comedy remake Going in Style. Does this newest film stand out in its sea of remakes and reboots or does it just fade into the background in amongst the other reboots out there in the 2017 movie lineup? Joe (Michael Caine), Willie (Morgan Freeman), and Albert (Alan Arkin) are three lifelong friends who spent many years (decades) working together for a steel factory. With the trio in their elder years of life, each one is a bit worse for wear, with a variety of issues to deal with, which only becomes more paramount when the friends learn that their pensions are being dissolved as the company transitions from America-based to overseas. Joe is particularly upset by the situation, trying to support his daughter and granddaughter, only to be faced with an eviction notice on their house, while Willie is in need of a new kidney, and Albert is sick and tired of being used by the unfair system. After witnessing a highly-successful bank robbery, Joe is inspired to plan one of his own, working to lure Willie and Albert to join him on this risky endeavor to collect what’s owed to them. While Albert finds a distraction in a new lover Annie (Anne-Margret) and Willie’s health becomes more of a concern, Joe charges full steam ahead with the mission, recruiting a low-level crook Jesus (John Ortiz) to show these three senior citizens “the ropes” of pulling off a proper bank heist, which draws suspicions from FBI Special Agent Hamer (Matt Dillion). I started blogging about movies since 2013 and since then I’ve seeing plenty of movies that have either been reboots or remakes of older properties (again from either television or feature films). Even before I started blogging, I saw many movies that were newer iterations of older films. As I said above, some of these remake / reboot movies have had success, while others flounder and are downright terrible (see 2010’s Clash of the Titans). One of the main problems with these films is that it tries to be speak to a modern audience. Yes, the acting might be better, the visuals effects might be more believable, and the overall film might be richer, but might lose something in its update retelling in trying to reach its current moviegoer viewers (see the difference between the 1960 vs. the 2016 versions of The Magnificent Seven). I can go on and on about this (might do an editorial piece on this subject), but you get the gist of what I’m saying. Anyway, I remember seeing the trailer for Going in Style and found it a bit funny, especially with its assemblage trio of elderly actors (Caine, Freeman, and Arkin). Before seeing the movie, I learned that the movie was a remake of the 1979 (same name), so I kind of had to get into that mindset of what this movie was going to be like (i.e. another remake of Hollywood). I didn’t get the chance to see the 1979 version, so I really can’t compare “apples to apples” between the two films (just throwing that out there). Any who, what did I think of this 2017 movie? Well, despite the talents of the film’s three leads, Going in Style doesn’t really standout as a film, playing as a fluff piece that seems just mediocre endeavor rather than leaving a lasting memorable impression. Going in Style is directed by actor / director Zach Braff, whose previous directorial works include several episodes of the TV show Scrubs, Garden State, and Wish I was Here as well as acting in Scrubs, Garden State, Oz, the Great and Powerful, and Chicken Little. Braff keeps the feature light on its feet, never turning the feature into a dark comedy like the film Choke or a violent bank heist film like the movie The Town. In truth, Braff treads a fine line of between 2001’s Ocean Eleven (a fun and amusing caper heist) and 2016’s Hell or High Water (dealing with serious real-world issues and of robbing banks). It’s definitely a weird blend, but Braff makes that the overall tone of the feature, finding his own groove from the start to finish. Basically, the movie finds the elderly trio as a sort of “Robin Hood” angle, finding them going up against big corporate business. In addition, the production quality, while nothing truly spectacular, feels appropriate and fits the industry standard of a feature film such as this. Unfortunately, the movie is far from being perfect or even reaching its goals that Braff was aiming for, leaving Going in Style a passable project in its undertaking. For starters, the premise (a trio of old-timer geezers organizing a bank heist), while funny on paper, just never really takes off. What causes this is that Braff lingers too much on the comedy aspect. Yes, the movie is a light comedy, but, despite the movie delving into some financial woes and elderly problems, Braff never goes far into the more dramatic aspect of the story, sapping the narrative (and proximity the movie) of any kind of meaningful / emotional impact to the plot or to any of the main characters. This results in the film being pretty vanilla, offering up little in innovation and/ or creativity. Also, while the movie moves at brisk pace (roughly a little bit over an hour and half long), Braff and screenwriter Theodore Melfi (the director behind Hidden Figures) never delves deep enough to make the picture meaningful. There’s plenty of social commentary areas that the movie could’ve covered from the uncaring attitudes of banks (and their financial suggestions) or the corporate greed of large companies, or even the whole structure of work class system. I know I’m not expecting something revolutionary or anything like that, but Going in Style could’ve benefited from interjecting more substance / subtext into its narrative rather than just skimming the surface. 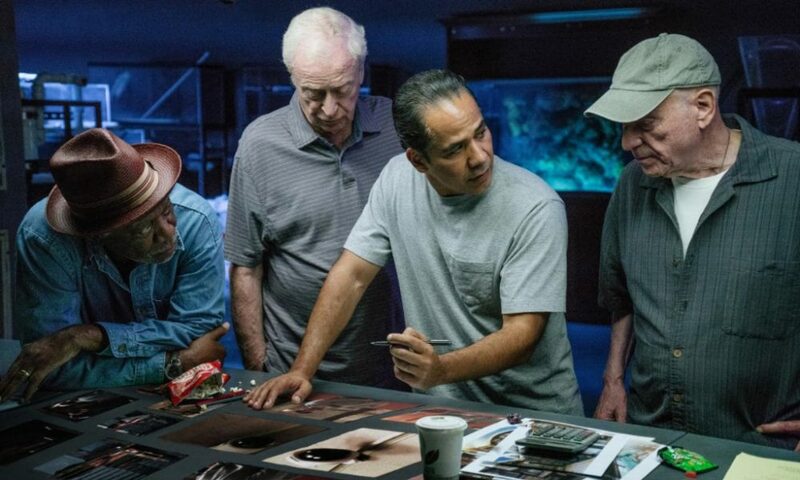 As a whole, Going in Style lacks being anything memorable, finding Braff (as well as Melfi) choosing the safer route in orchestrating the film’s story. This means that the movie is formulaic and predictable, navigating through some familiar beats of accomplishments and setbacks that many can see coming. This is where the film need to be elevated by something new or creative. Unfortunately, beyond the elderly angle, the movie never challenges itself and rarely standouts from the normal of recognizable scenarios. Also, while the film stays more on the comedy side, the movie’s humor is somewhat hit or miss, utilizing a lot of old people jokes and gags that can be funny, but aren’t quite uproariously hilarious. All in all, Going in Style’s comedy has its moments, but (again) nothing memorable. Of course, the big highlight of the feature is seeing the trio of actors (Michael Caine, Morgan Freeman, and Alan Arkin) playing Going in Style’s main leads. Of the three, Caine’s character Joe is the film’s primary protagonist, getting most of the camera spotlight and being the more “mastermind” of the group as well as some dramatic key moments. While Caine’s Joe is more of “straight man” archetype of the trio, Arkin’s Albert is more of the “grumpy” funny man of them all, utilizing his natural sarcastic approach in delivering his lines in his situations. As for Freeman, he strikes a nice balance between drama and comedy with his character of Willie. As to be expected, all three deliver fine performances and their natural screen presence and abilities are showcased as they interact with one another (they have great chemistry) and with other actors throughout the film. It may not be their definitive roles of their careers, but it definitely the best part of movie. Plus, it’s a joyous fun to see the three actors together in the same film. 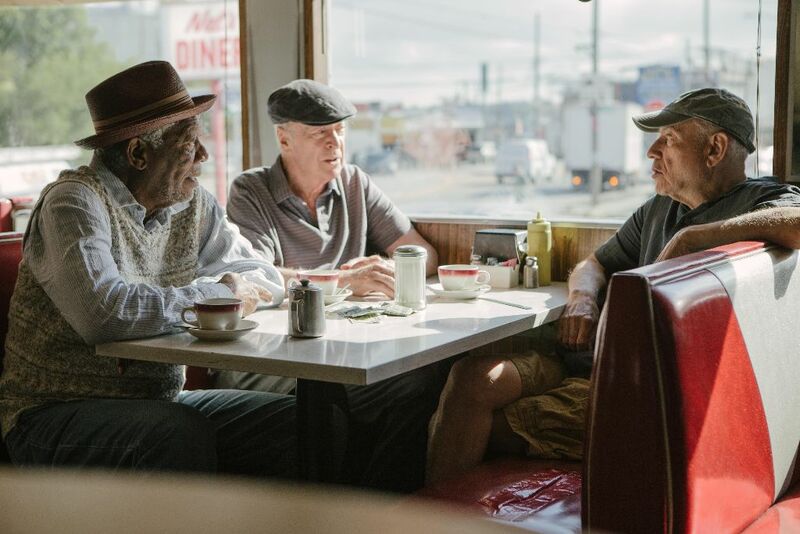 The supporting cast in Going in Style is woefully underwritten, While Braff’s direction and Melfi’s script keeps the story spotlight on Joe, Willie, and Al, the rest of the secondary characters are simply reduced to stock-like characters without much to contribute to the story. Actor Matt Dillion plays FBI agent Hammer, who investigates the bank robbery, but the character isn’t nothing new or original. Dillion’s performance is okay, but he can’t elevate his character from being a one-dimensional archetype FBI agent (a sort of cliché). The same goes for John Ortiz’s Jesus, who is bland (almost generic) criminal character that agrees to help the trio out with their task. Again, like Dillion, Ortiz’s acting is okay, but his character of Jesus is nothing spectacular. Adding to that pile is actress Ann-Margaret who plays the character of Annie. She and Arkin’s Al have a love interest subplot in the film, but, while it does have some funny bits, it feels completely unnecessary. Thus, Margaret’s Annie presence in the movie largely feels irrelevant. Probably who delivers the most memorable role of the supporting players is Kenan Thompson (90s kids will remember him from TV show Kenan & Kel) as a grocery store manager, delivering some big laughs, despite his far too brief appearance. Lastly, before I forget, Back to the Future star Christopher Lloyd (man…. he’s still alive and can still act) as some funny bits as the side character Milton). You’re never too old to get even” is a fitting tagline as a trio of senior citizens planning to rob a bank in the movie Going in Style. Director Zach Braff’s film has wacky and humorous plot that looks good on paper and does have an excellent chemistry within its three leads (thanks to Caine, Freeman, and Arkin’s screen presence and rapport with one another). Beyond that, however, the movie doesn’t stand out from other comedy movies, feeling mediocre in almost all aspects from its formulaic plot, its thinly-written narrative, and underdeveloped side characters. Personally, I thought the movie was sort of bland. Sure, it had some moments to like and laugh at, but (as a whole) the movie just feels unimpressive. Thus, unless you’re a diehard fan of the three main actors, there’s really no rush to see this movie. Best to just wait for it to come out on TV or just skip it altogether. As Hollywood will continues its trend to produce remakes and reboots, Going in Style, which will probably fade into the background of the 2017 movie releases, should be used a cautionary tale of sort; a prime example of how an idea on paper might not translate well on-screen. In short, Going in Style feels more like a missed opportunity than instead of wholesome comedy motion picture. Thanks for reading. Yeah, the movie was only good to have Caine, Freeman, Arkin in it. Beyond that, the movie was pretty bland. I love these guys, but it’s so forgettable. Definitely agree. Love those three actors, but this movie was so unmemorable. Thanks for reading and for commenting! It was bland and forgettable but I liked it a little more because the chemistry between the three leads made it feel genuine. Oh definitely agree with you on that. Caine, Freeman, and Arkin were great in it (and had great chemistry with each other), but that was the only highlight of the film.